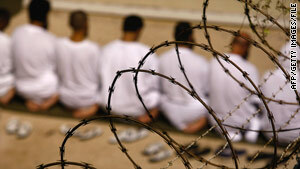 Detainees pray at the Guantanamo Bay, Cuba, detention center in 2009. Washington (CNN) -- The United States is halting for now its plans to continue transferring terror suspects detained at the Guantanamo Bay, Cuba, facility to Yemen, President Barack Obama said Tuesday. "We will not be returning detainees to Yemen at this time" due to the "unsettled situation" in the country, Obama told reporters in a statement on the failed Christmas Day terror attack on a U.S. airliner. Obama said his government remains committed to closing the Guantanamo facility, which will require transferring the roughly 200 remaining detainees to either an Illinois prison, their home countries or a third country. The Guantanamo facility was "a specific rationale" for the creation of al Qaeda on the Arabian Peninsula, the group linked to the botched December 25 bombing attempt of Northwest Airlines flight on its final approach to Detroit, Michigan, Obama said. Earlier Tuesday, White House Press Secretary Robert Gibbs said Yemen is "not capable of handling" additional returned detainees now. U.S. authorities have said 23-year-old Faruk Umar AbdulMutallab may have received training from al Qaeda in the Arabian Peninsula, which is based in Yemen. On Christmas Day, AbdulMutallab allegedly attempted to blow up an international flight into Detroit, Michigan. On Sunday, John Brennan, the assistant to President Obama for homeland security and counterterrorism, said the transfer of Yemeni detainees at Guantanamo Bay back to Yemen would continue after careful review of the situation. The United States is working with the Yemeni government to make sure "the situation on the ground is taken into account," Brennan said on CNN's "State of the Union."